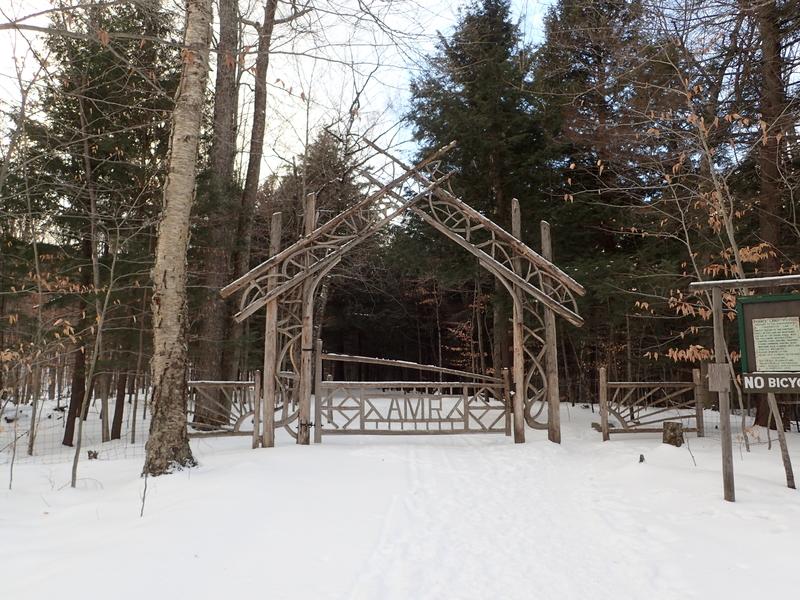 Now that the holidays are officially over my weekends are free once again, and what better way to ring in the new year than with a beautiful Adirondack hike? 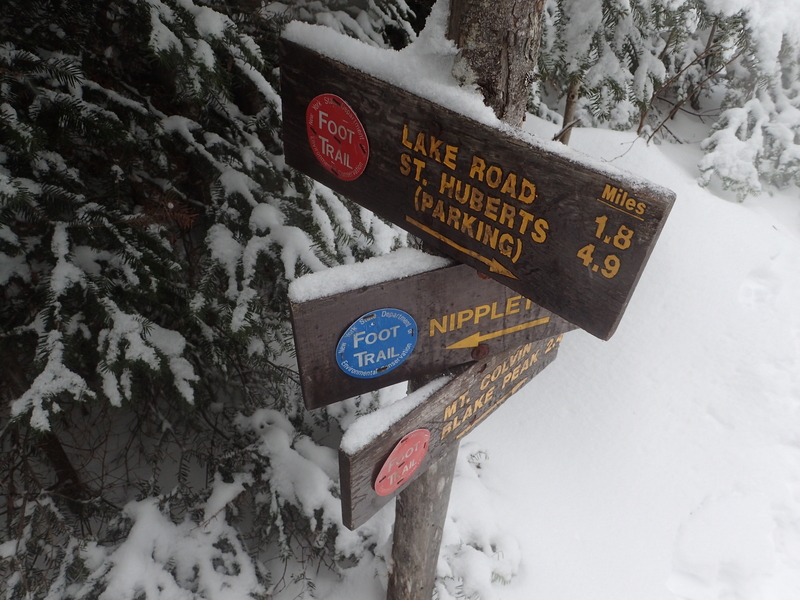 For the first hike of 2016 Kelly and I decided to go with Dial and Nippletop as she needed them for her 46 and I needed them for my winter 46. 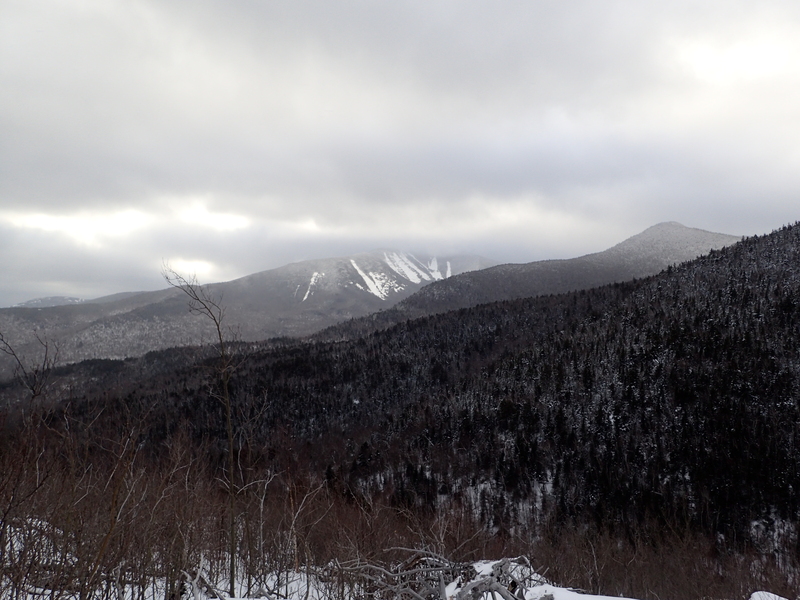 It was a cold and windy day but that is nothing new for the High Peaks this time of year and we had a great time. We left New Jersey Friday night and decided to try something new in regards to our lodging for the evening. Normally we would stay in Lake Placid but this time of year the hotel prices can be pretty crazy so we instead opted to stay in Saratoga Springs (which was less than half the price!) and then drive up the last hour and a half the morning of the hike. This plan worked out really beautifully. After waking up bright and early we arrived at the St Huberts parking lot a little before 8am. After gathering our gear for the day we began the walk down the road past the Ausable Club to the trail register and start of the hike. 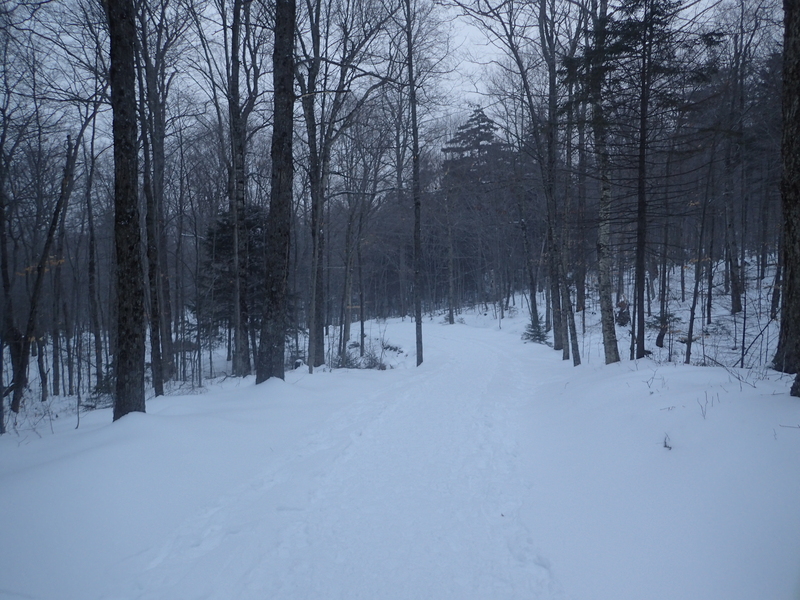 Hiking along the road through the Ausable Club to the trail register. After a quick walk down the road we arrived at the trail register at the end of the road and signed in at 8:15 am. Just past the trail register is the gate which blocks vehicles from driving down Lake Road. Gate on Lake Rd at the start of the hike. We decided to do the hike in a clockwise direction which meant beginning with a short section on the road before turning onto the H.G. 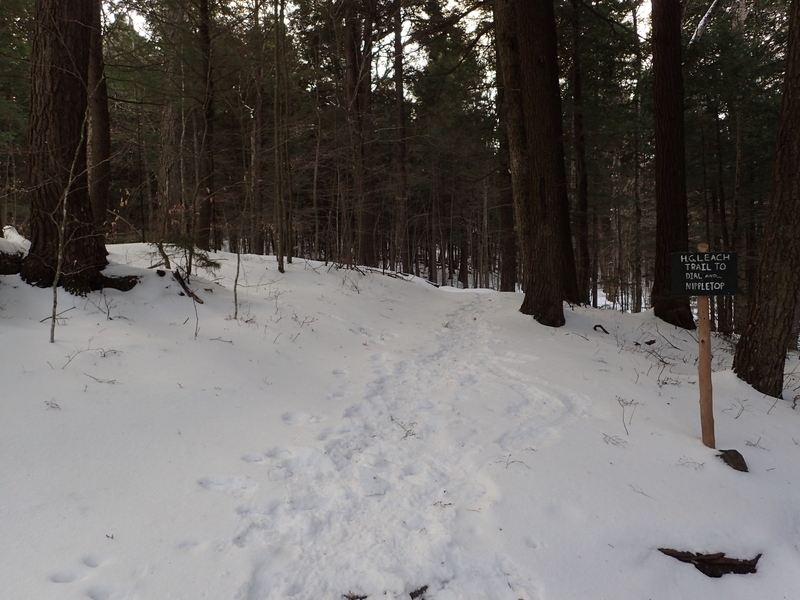 Leach Trail which traverses the Noonmark Shoulder and Bear Den Mountain before reaching Dial and Nippletop beyond. I prefer doing the hike this way as you get the hardest part done first and then after descending Elk Pass its just an easy stroll back down the road. 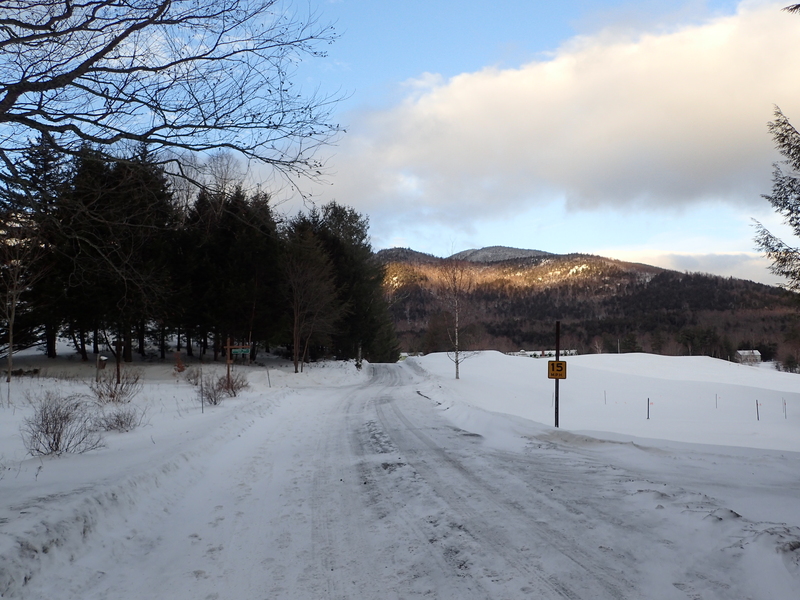 Lake Rd was covered in snow and would have made for nice skiing. After a short hike down the road we arrived at the junction with the H.G. Leach Trail on our left. 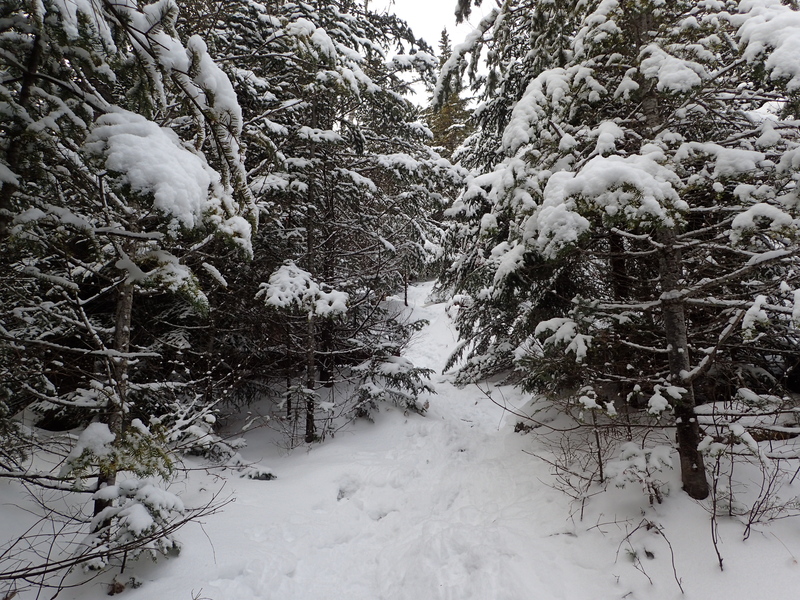 The snow was generally well packed and not more than a couple of inches most of the day so we didn’t need to use snowshoes. We also did not end up using our micro spikes until the descent down Elk Pass. Once we were on the H.G. Leach Trail the hiking really began. The hike up to Bear Den and beyond is not technically hard but the elevation gain is constant all the way to the top, but its nice to remind yourself that once you reach the top nearly all the elevation gain for the day is done. 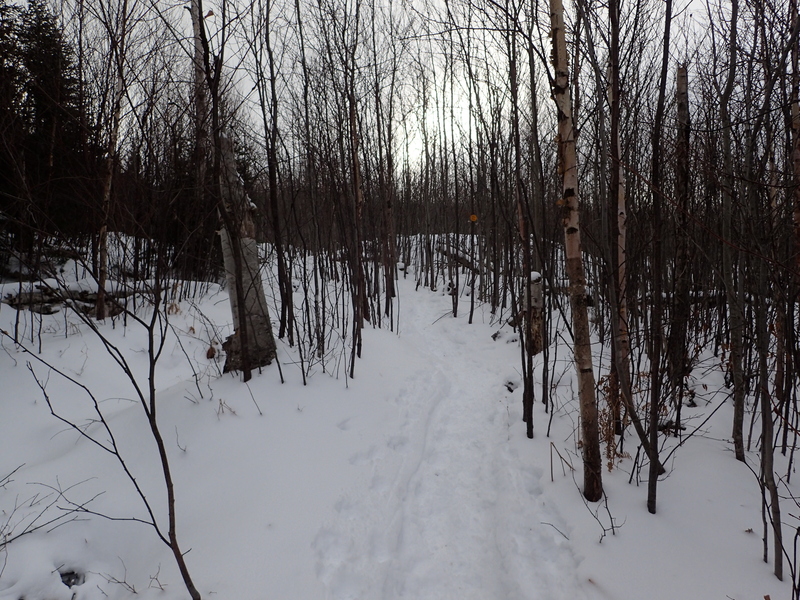 Luckily the trail was already broken in and it was easy to follow so we were able to make good time. Trail near the start of the H.G. Leach Trail. 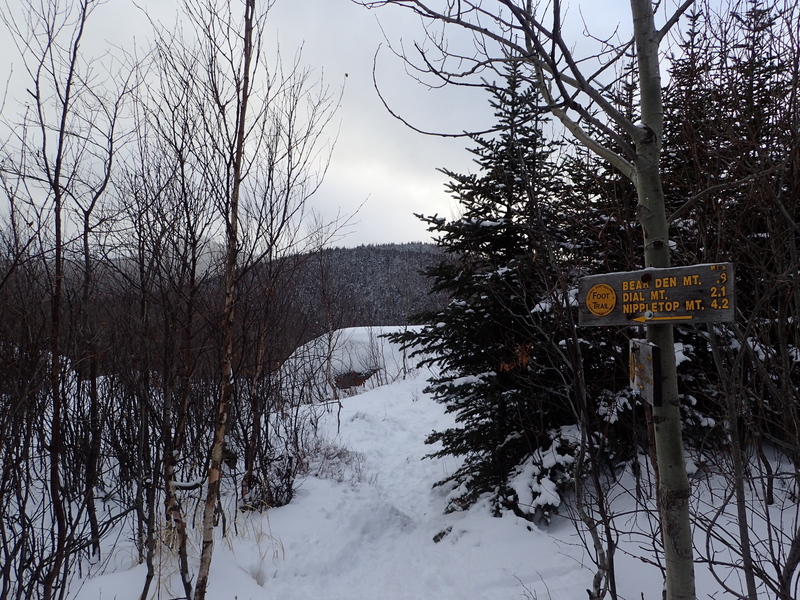 After a little while of hiking up the hill we came to the signs marking that we were leaving the Ausable Club property and entering the High Peaks Wilderness. Shortly after the signs the trail has an arrow pointing you left around some short cliffs. Kelly at the arrow junction. 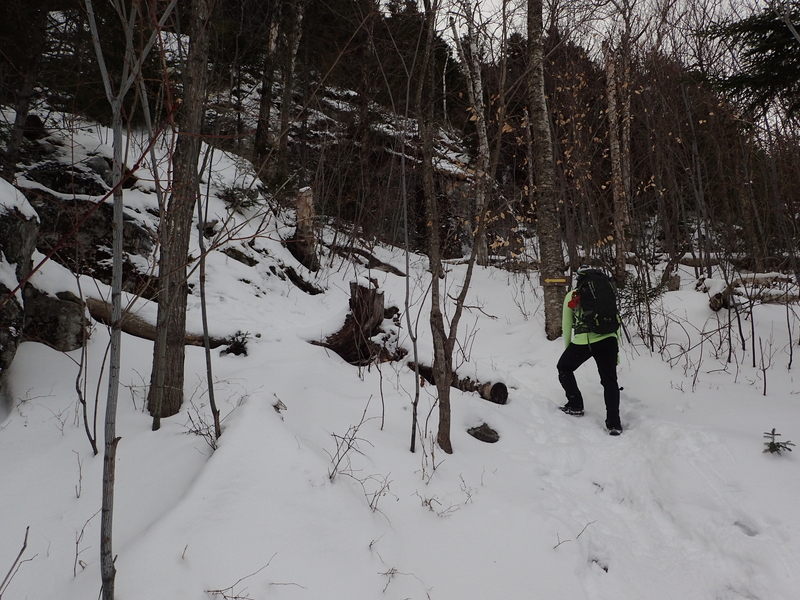 From this point the trail gets a little steeper before finally topping out on the ridge of the Noonmark Shoulder. 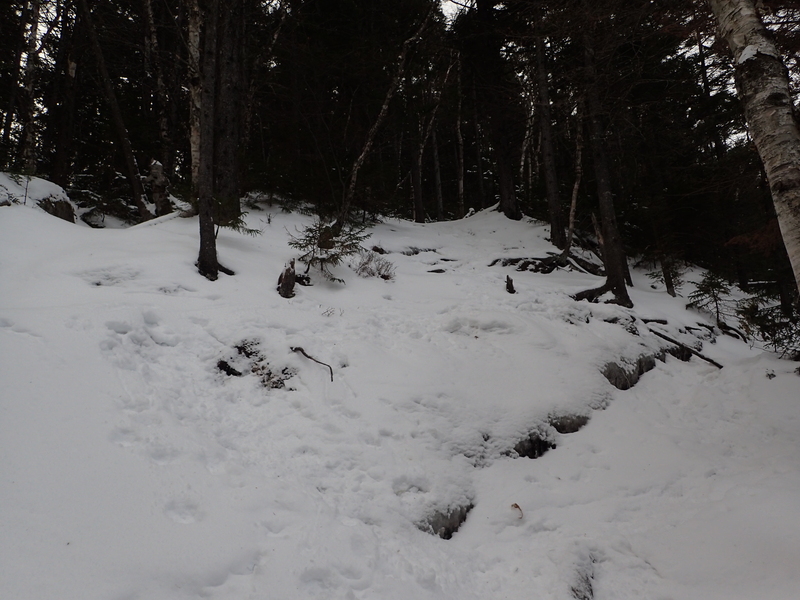 This section is usually a rock slab but was now completely covered in snow and ice. 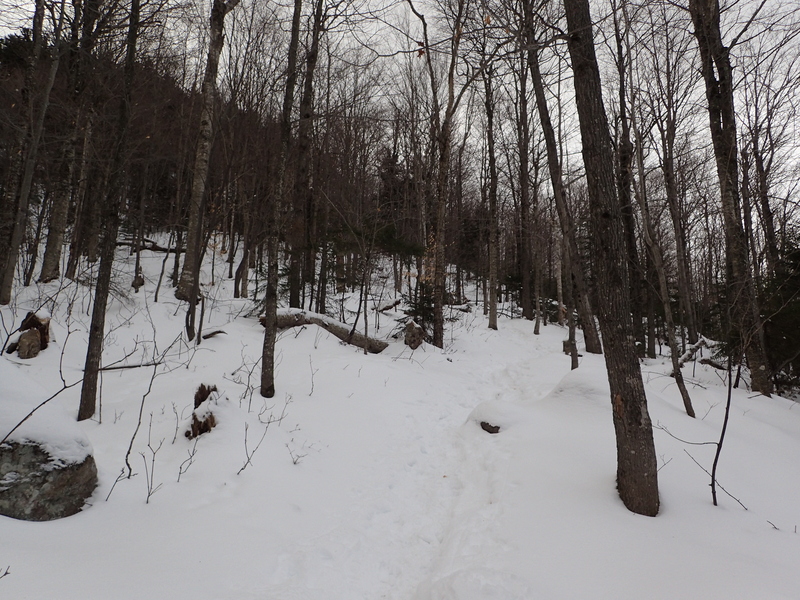 Despite the increased steepness there was enough fresh snow that we did not need our microspikes to safetly navigate the trail. Beyond the covered slab we continued the hike up the ridge through increasingly coniferous forest. Shortly before coming to the lookout on top of the Noonmark Shoulder you pass through what I now found out is an Aspen grove. This is interesting because prior to the Noonmark Fire in 1999 there were no Aspen trees in this area at all and as far as I know there is no clear explanation for why they are there now. Aspen grove near the top of the Noonmark Shoulder. Shortly after passing the Aspen trees we came to the junction marking the top of the shoulder as well as the bare ledges which offer great views of the surrounding area and particularly the Great Range. Trail junction marking the top of the Noonmark Shoulder and overlook ledges. Sadly the views from the overlook on the shoulder were the best views we got all day as after we passed this overlook the clouds moved in and remained in place for the rest of the day. 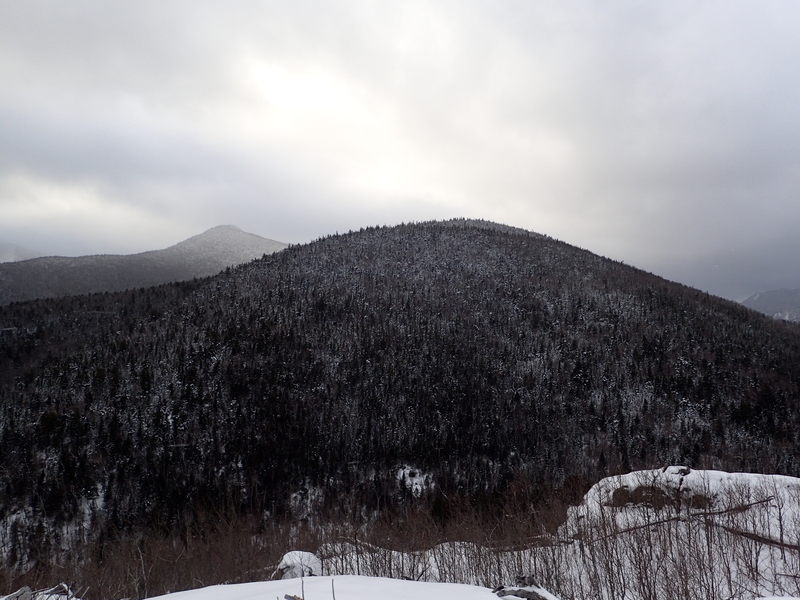 View from the Noonmark Shoulder. Knowing we had a lot of hiking left to do we did not linger too long and started making our way over towards Bear Den Mountain. 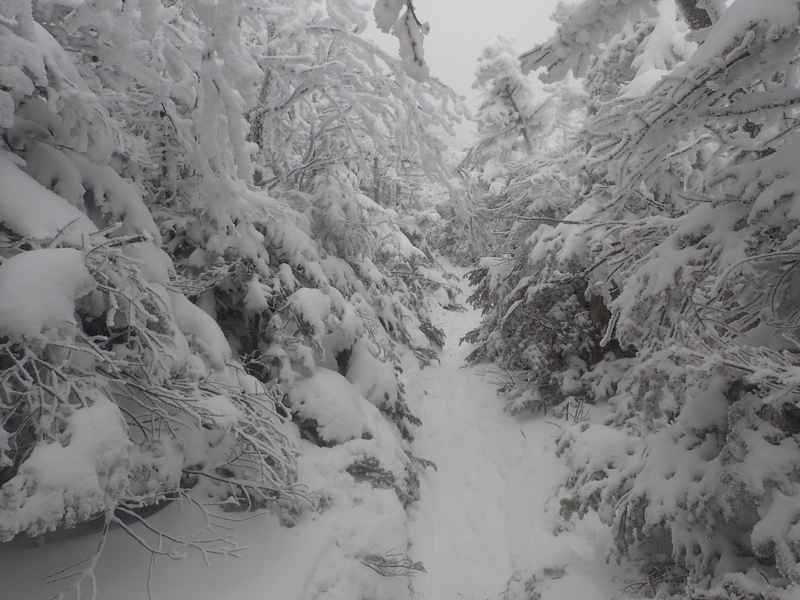 The trail drops sharply off the side of the Noonmark Shoulder into a small col before ascending back up the side of Bear Den Mountain. 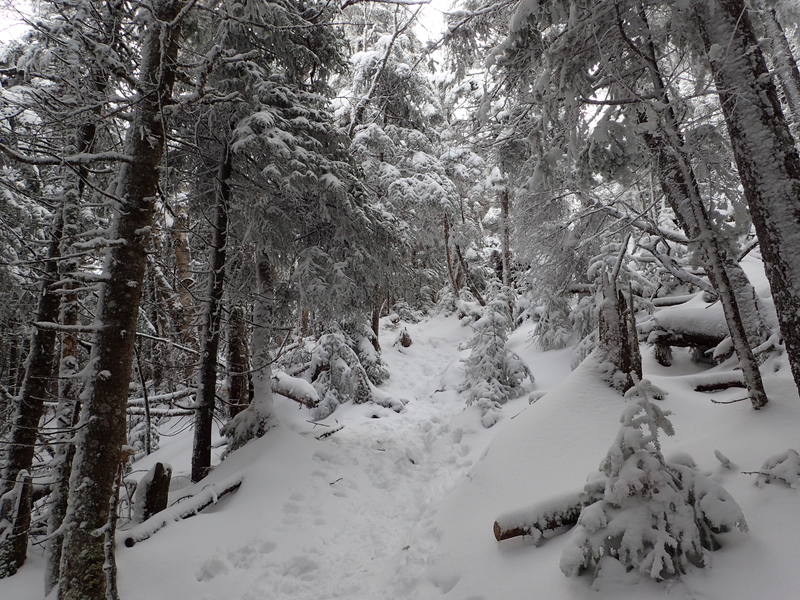 This section of hiking was fairly uneventful overall but the snow cover did make it beautiful. Bear Den Mountain is completely wooded and without the trail junction sign you would probably not even realize that you had climbed it. 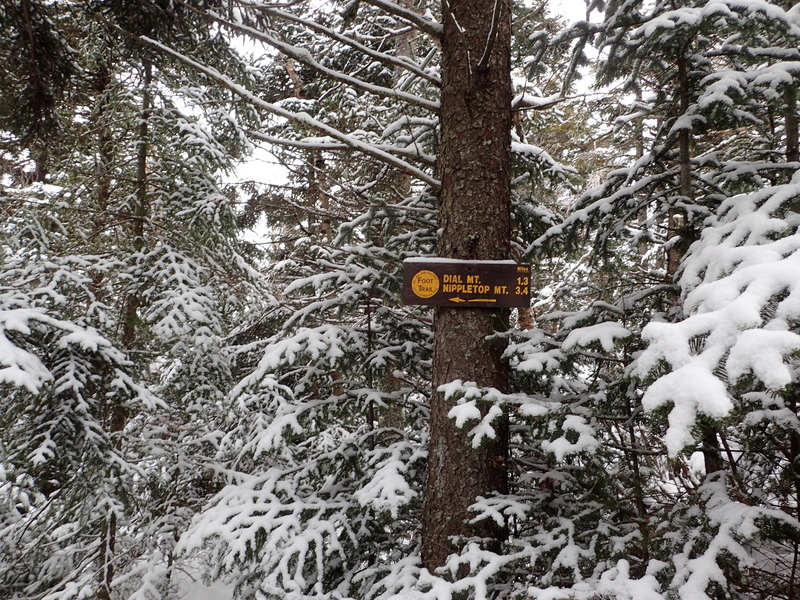 Since there was no view to speak of from the trail we just kept on trucking down the trail towards the summit of Dial. Trail junction near the summit of Bear Den Mountain. From the summit of Bear Den it was another 1.3 miles to the summit of Dial. The trail continued its constant uphill trajectory and we just kept plodding along. 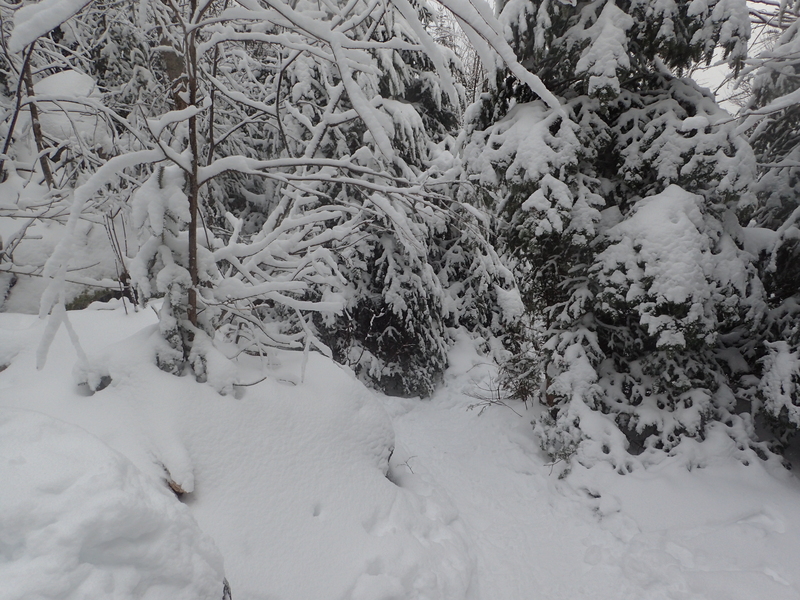 The trail at this point was still in good shape but the snow became increasingly deeper. The temperature also dropped quite a bit and we had to keep taking on and off layers to find the right balance. Trail to Dial Mountain from Bear Den Mountain. Despite the increasingly tough conditions we made it to the summit of Dial in good time and without any issues. The summit of Dial is wooded, but there is a large boulder that you can climb on top of which normally offers some nice views of the surrounding area and the Great Range in particular. Unfortunately for us the clouds had moved in quite a bit and the views of the surrounding peaks were almost completely obscured. The wind on top of the overlook rock was also quite intense so we didn’t linger very long. According to the weather report wind speeds on the summit were somewhere in the 30-40 mph range. 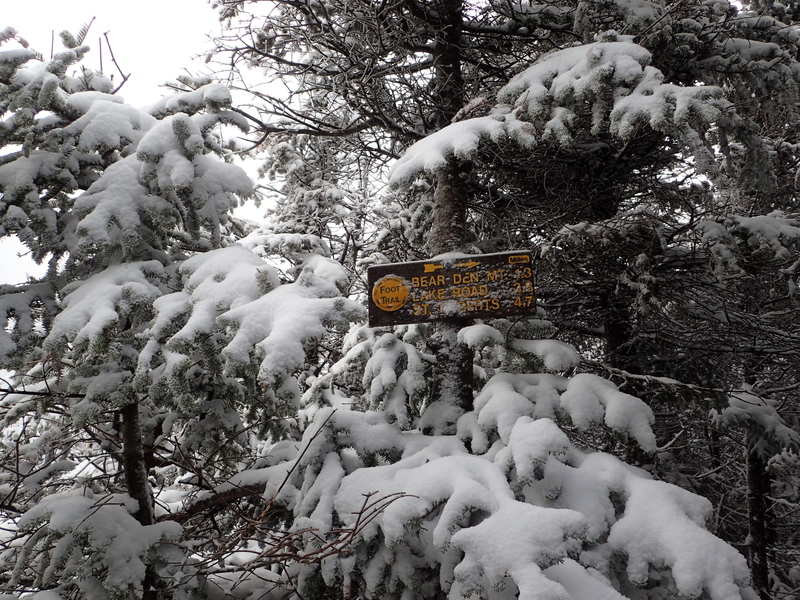 Trail junction sign near the summit of Dial Mountain. 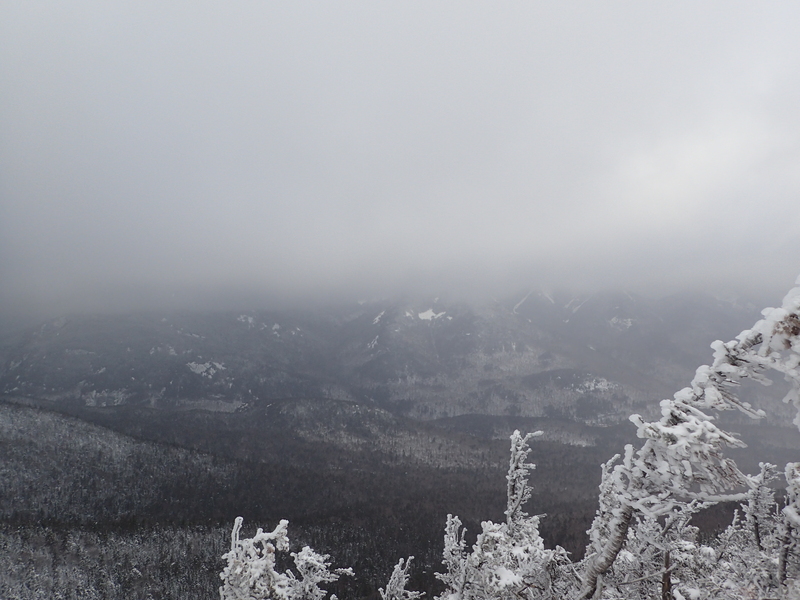 Obscured view of the Great Range from Dial Mountain. View of Nippletop covered in clouds from the summit of Dial. Due to the wind and lack of views we didn’t stay on the summit long and continued down the trail for the last 1.9 miles to the Elk Pass and Nippletop trail junction. After descending a little ways past the summit of Dial we stopped to put on our micro spikes which we wanted to have ready for the next section of steeper ups and downs on the way to Nippletop and especially for the descent down Elk Pass. By the time we had made it about halfway between Dial and Nippletop we began to see hikers coming in the opposite direction which ended up being the only people we saw the entire day. The hiking through this section was not terribly difficult and was just a constant series of short ups and downs over small bulges on the ridge. If I’m being honest it seemed like this section dragged on forever and I was just ready to be done with it. I vaguely remember having the same feeling the last time I did these peaks as well! 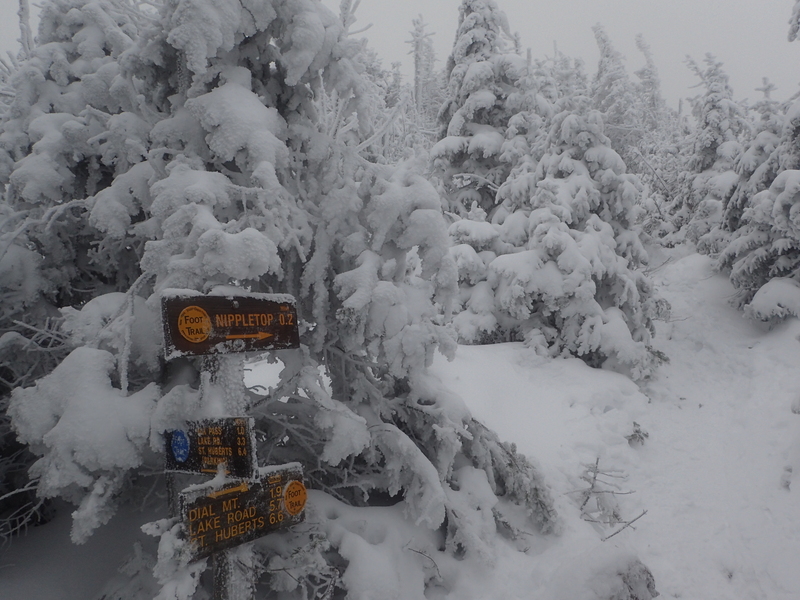 Once we got closer to the summit of Nippletop we were mostly in the clouds and the snow cover got a good bit deeper. Trail nearing the trail junction for Elk Pass and Nippletop. After what seemed like an eternity we reached the trail junction for Elk Pass and Nippletop and it felt great. Trail junction for Elk Pass and Nippletop. We didn’t waste any time celebrating and simply powered on to the summit. A short series of easy ups and downs put us on the summit. We didn’t stay as we could hardly see anything and the wind was blowing pretty strongly so we simply continued back the way we had come and started our descent down Elk Pass. The 1.0 mile descent down Elk Pass was perhaps the highlight of the day as the steep sections of snow covered slab made for some fun sliding and a quick descent. I was also reassured by our decision to do the hike in this direction as I think overall it was much faster and easier than the alternative would have been. After our quick and fun slide down the pass we hiked past the beaver ponds which seemed to only be partially frozen at this point. After a total of 1.5 miles from the previous junction we arrived at the trail junction for Blake and Colvin. Trail junction for Blake and Colvin after descending Elk Pass. Once we descended to this point the weather had cleared up a bit and we were able to pick up our pace for the remaining descent. 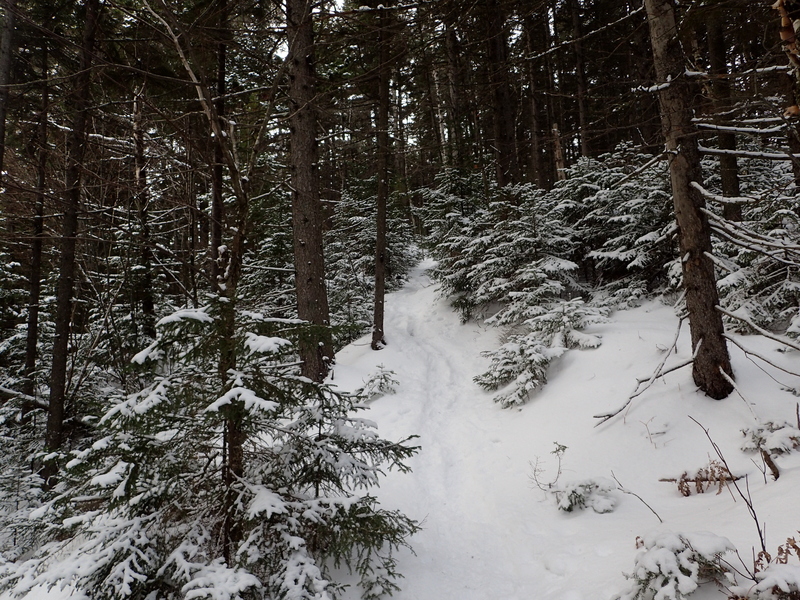 The trail was still quite snow covered but all of the people who we passed earlier had done a nice job breaking out the trail for our descent. 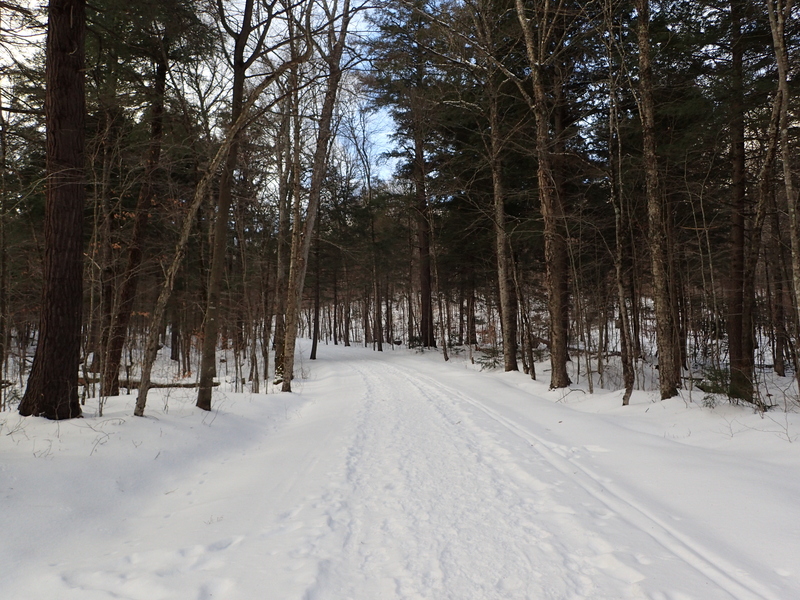 Trail past the Blake and Colvin trail junction. 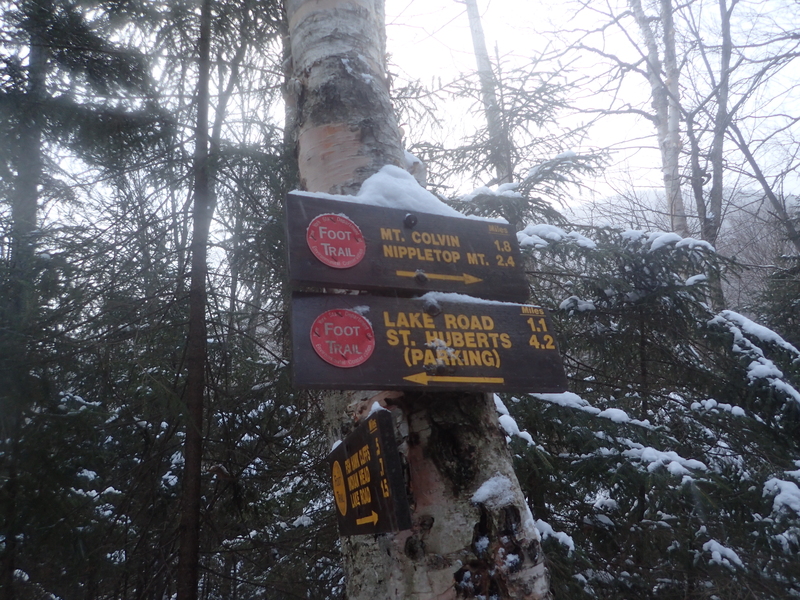 After a short 0.70 mile section of trail we arrived at the next trail junction marking the way back to Lake Rd and ultimately the parking lot in St Huberts. Trail junction marking the last 4.2 miles back to the parking lot. From this point on the trail got increasingly easier and the weather also warmed up a bit making it easier for us to make quick progress down the trail. Once we made it about halfway down the last 1.1 miles to Lake Rd we passed an Ausable Club trail sign pointing us in the direction of the road. Shortly after passing this sign we came to a small waterfall along the Gill Brook. It was only partially frozen and offered a nice place to stop for a snack before working our way down the final few miles down Lake Rd. 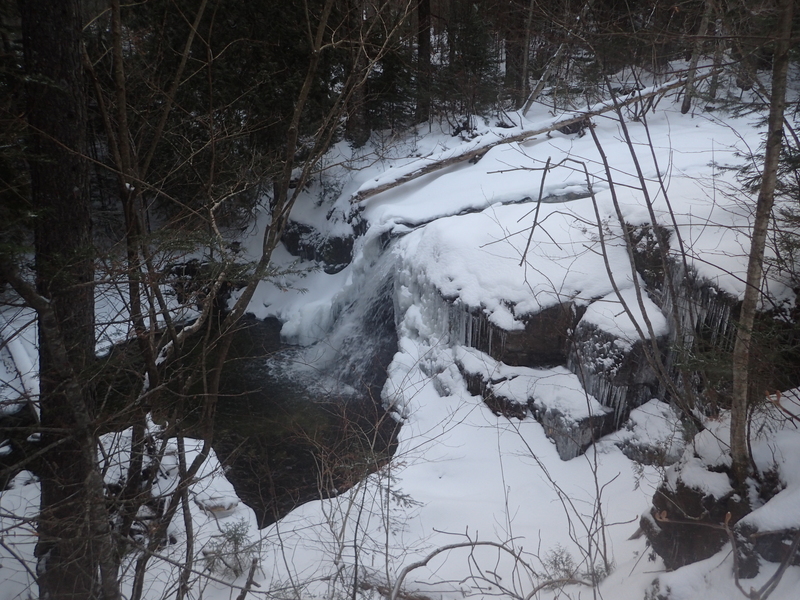 Small waterfall on Gill Brook. After passing the waterfall and walking next to the brook for a short ways we came to the final trail junction of the day. 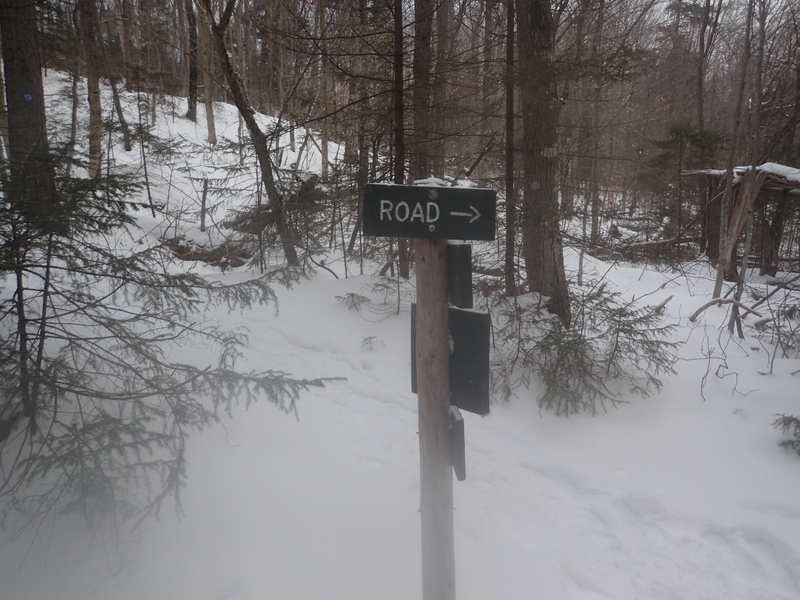 At this junction you can choose to either continue straight down the Gill Brook Trail which is more scenic or simply cut across the woods to Lake Rd which is faster. We opted to take the cutoff to the road as it was already getting late in the day and we preferred to finish in the light if possible. Final trail junction before reaching Lake Rd. 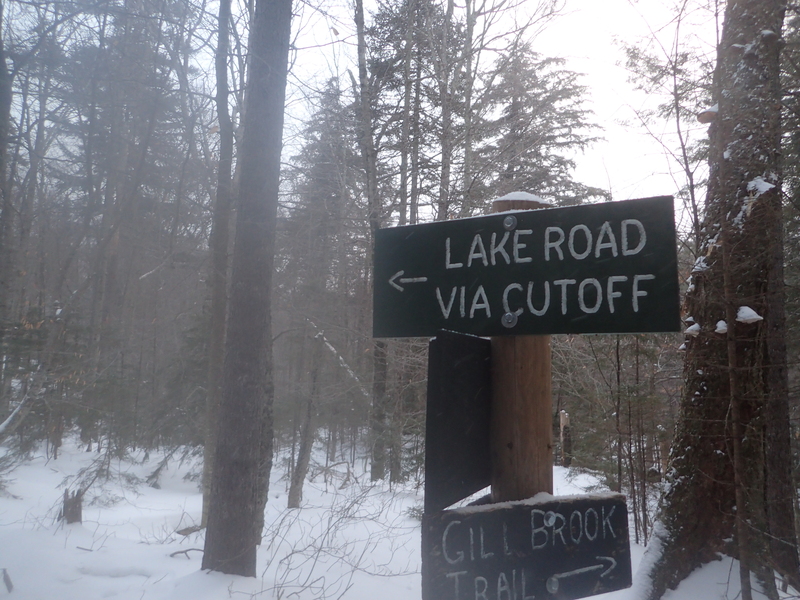 The trail cutoff was mostly flat and we reached Lake Rd in no time. From here we had a few miles of boring road walking before making it back out to the trail register and our car beyond. Looking down Lake Rd from the junction with the cutoff. An uneventful walk put us back at the trail register at about 5 pm on the dot. We made it back out to the road just as it was getting almost completely dark which worked out well. After a short walk back to the car in the dark we packed up our things and set off on our 4 hour drive back to New Jersey. 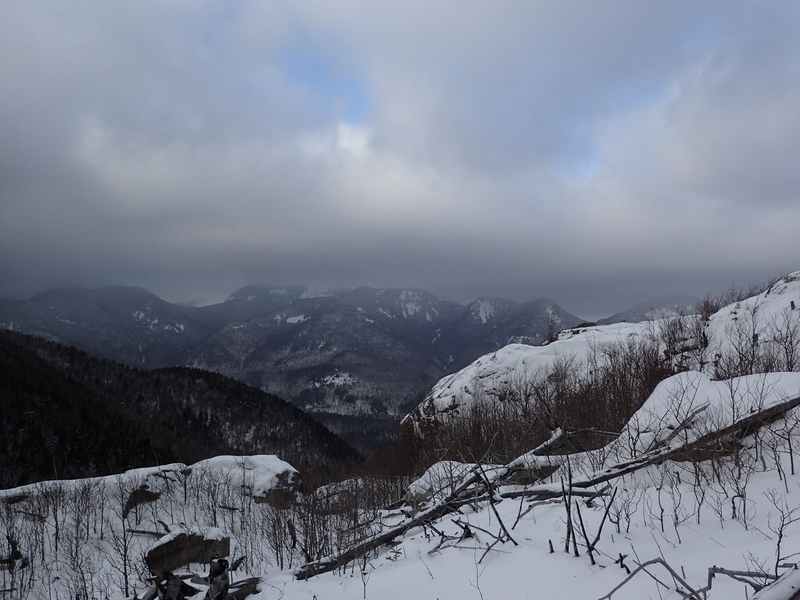 Overall it was a great day out in the High Peaks and I was glad to get the new year started off on a high note. 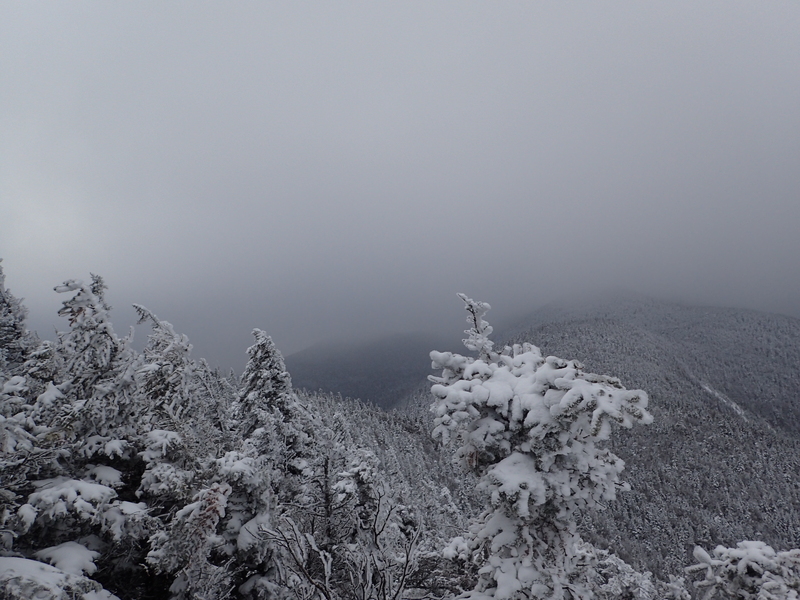 The weather wasn’t very cooperative in terms of views but we still had a great time as we always do hiking anywhere in the Adirondacks.